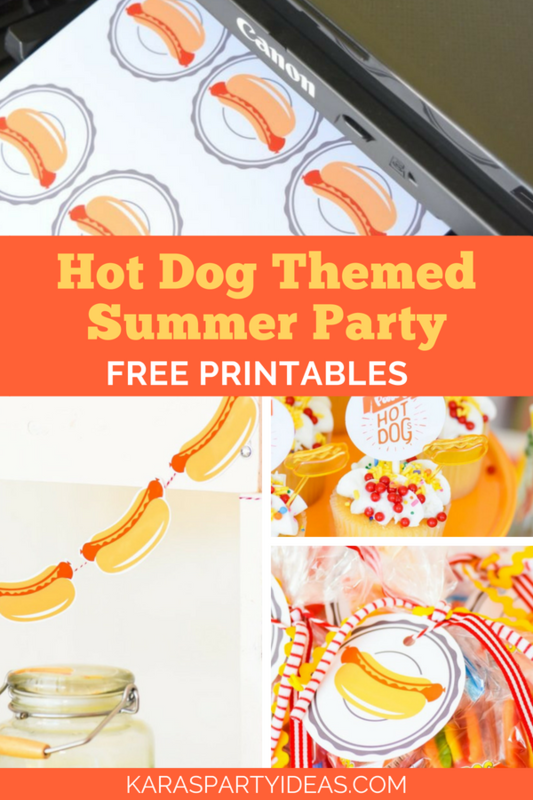 Hot Dog Themed Summer Party- Free Printables! 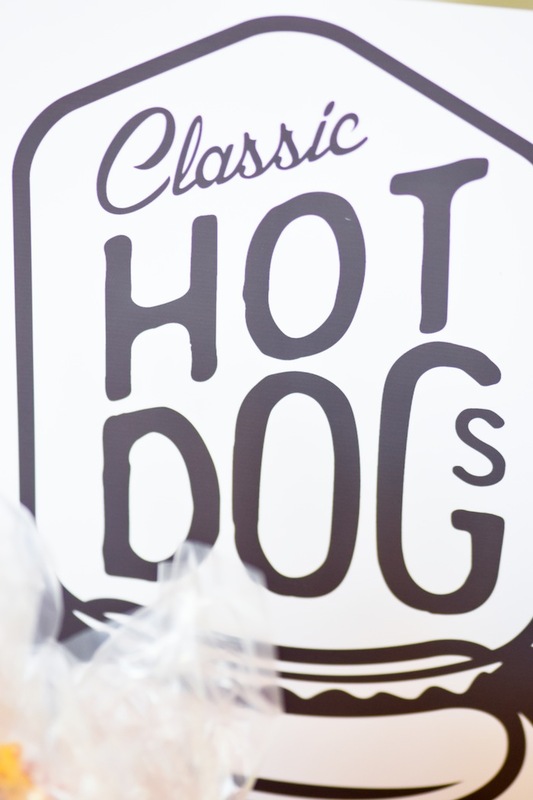 Hot dogs!!! 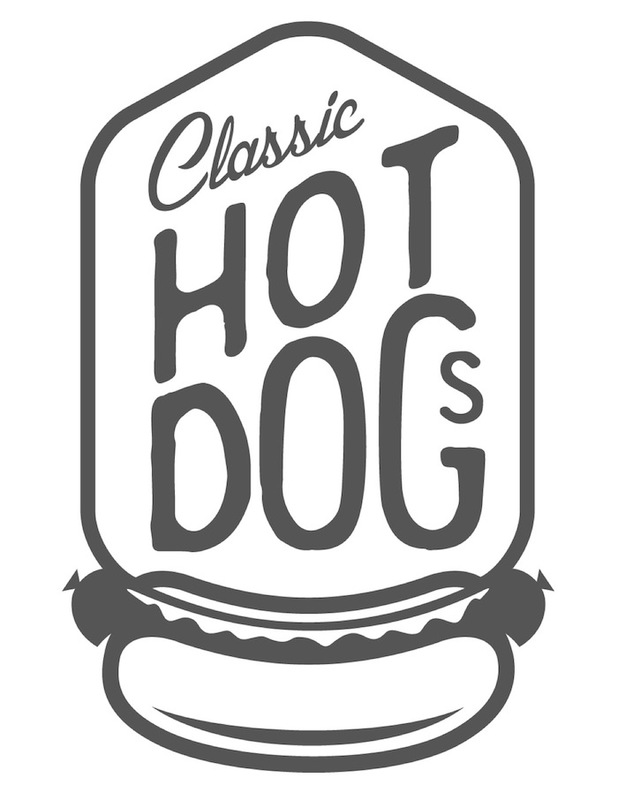 Get your hot dogs here!!! 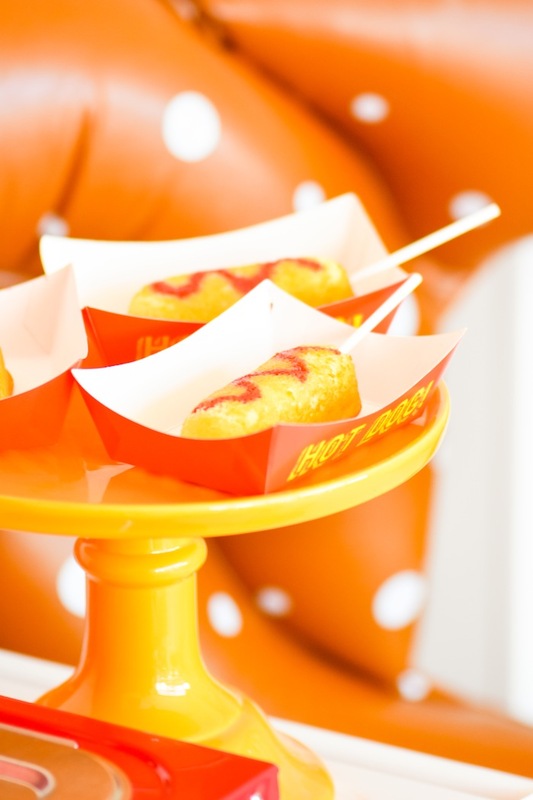 We’ve got mustard, we’ve got ketchup! 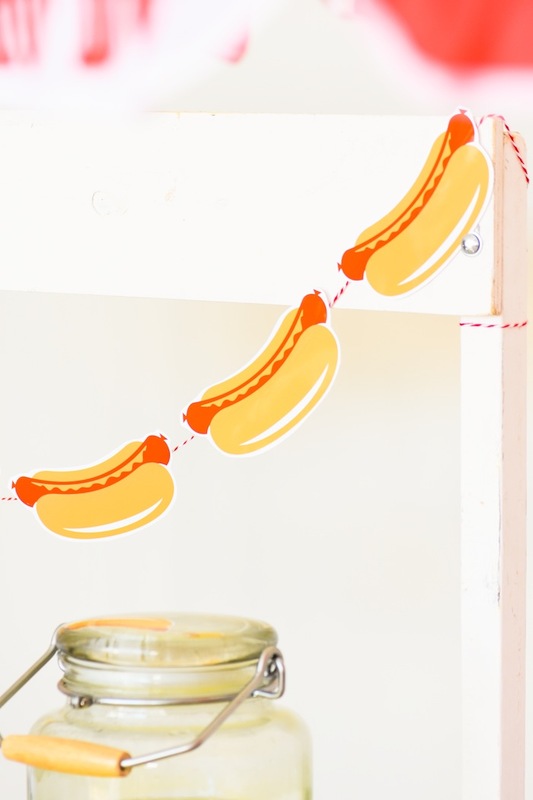 We’ve got cheese and don’t forget the relish!! 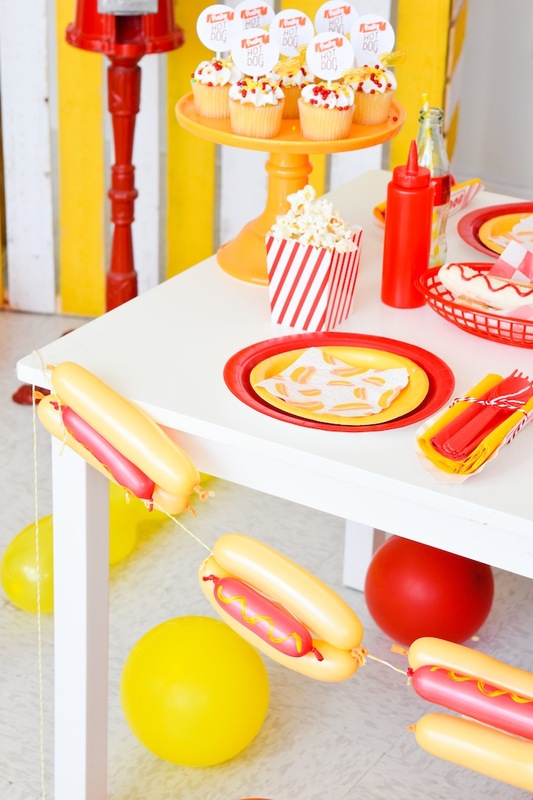 Did you know that July is National Hot Dog Month?! 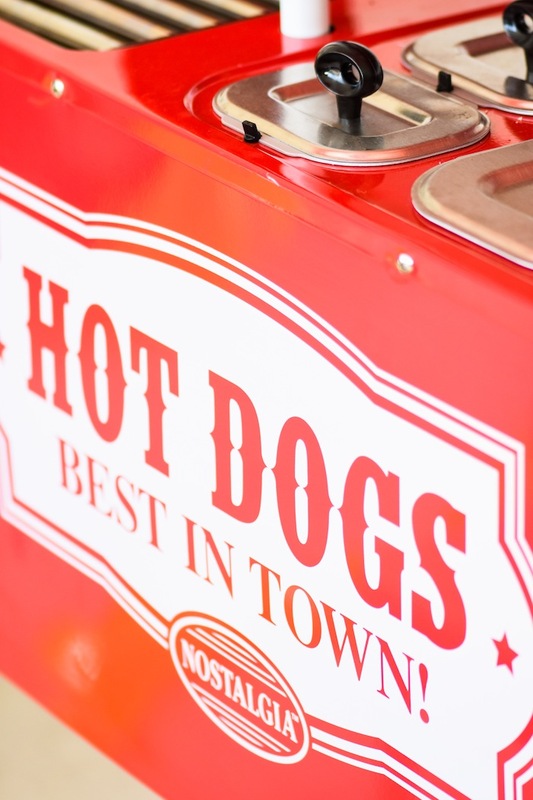 When it comes to all-American food, you can’t get much better than the hot dog! 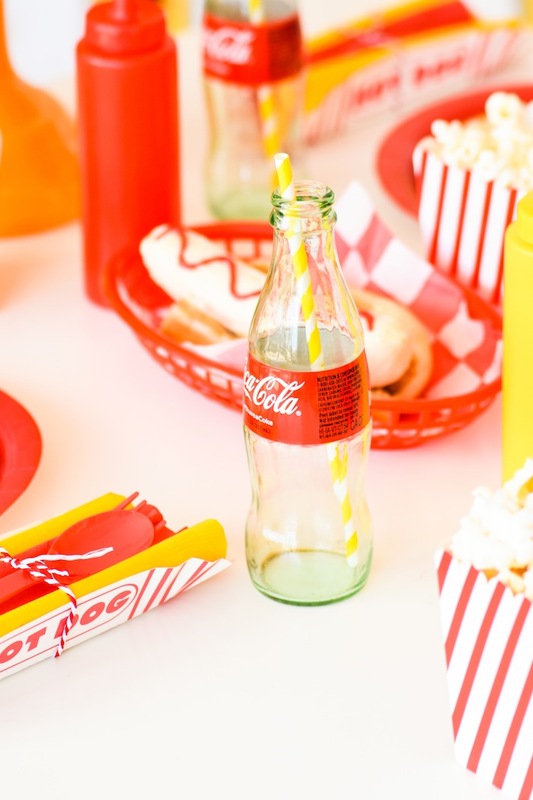 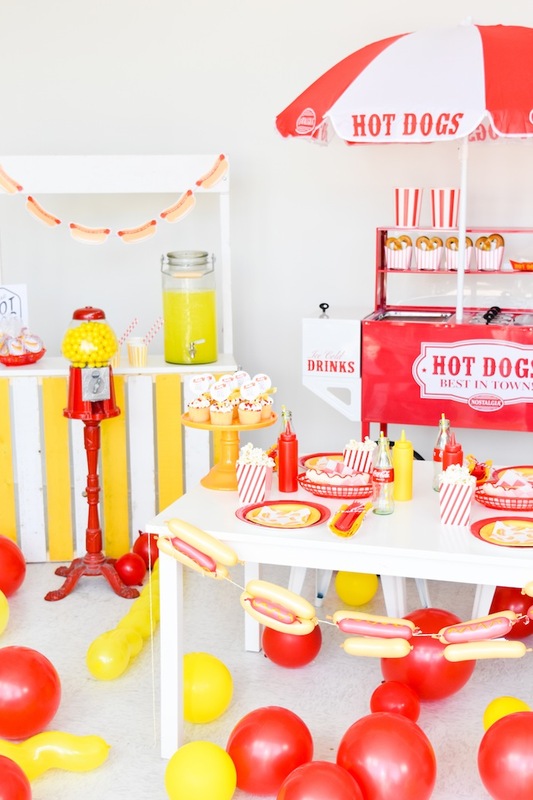 Plus, with summer in full-swing, a Hot Dog Themed Summer Party is the best way to celebrate! 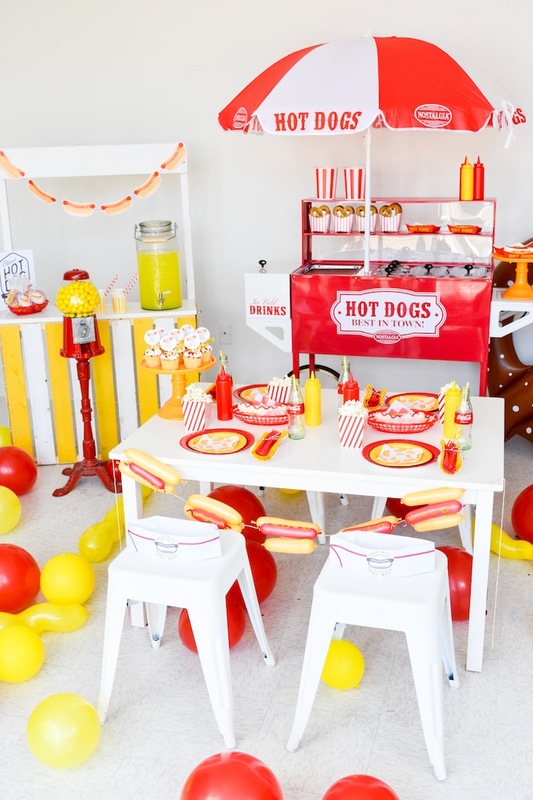 For my hot dog party, I didn’t do the traditional hotdog, mustard, ketchup, cheese and relish. 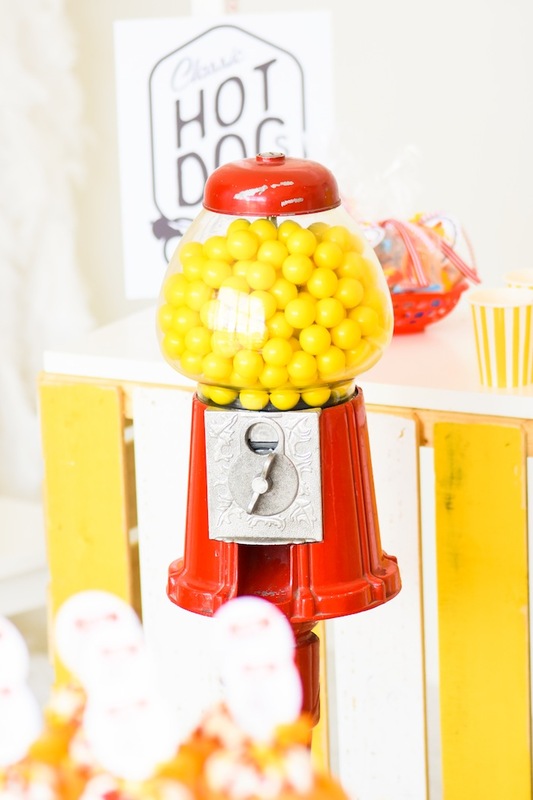 I chose a little sweeter way to party. 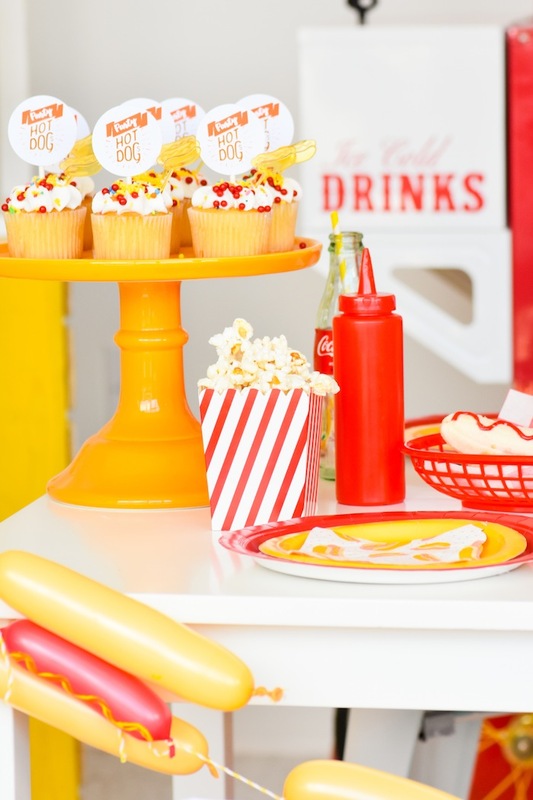 I chose a color scheme of yellow and red to go along with the classic hot dog. 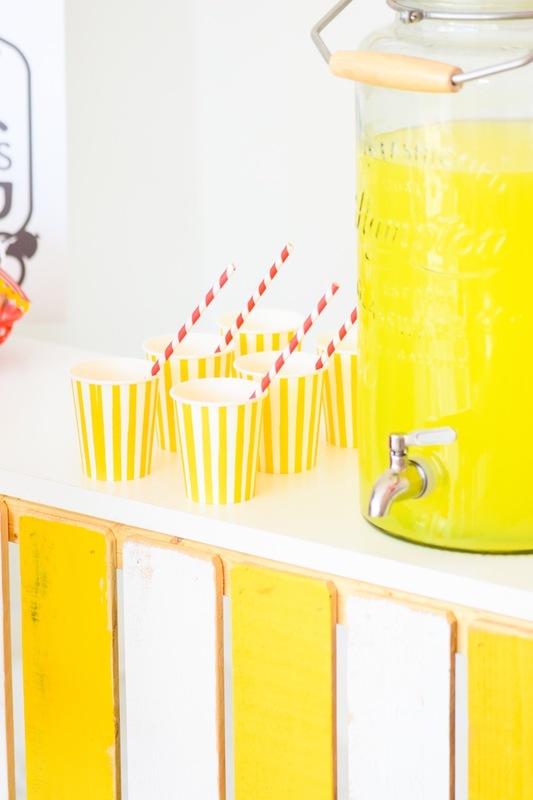 The balloons on the floor were a fun element, and the lemonade stand in the back added the perfect touch of yellow. 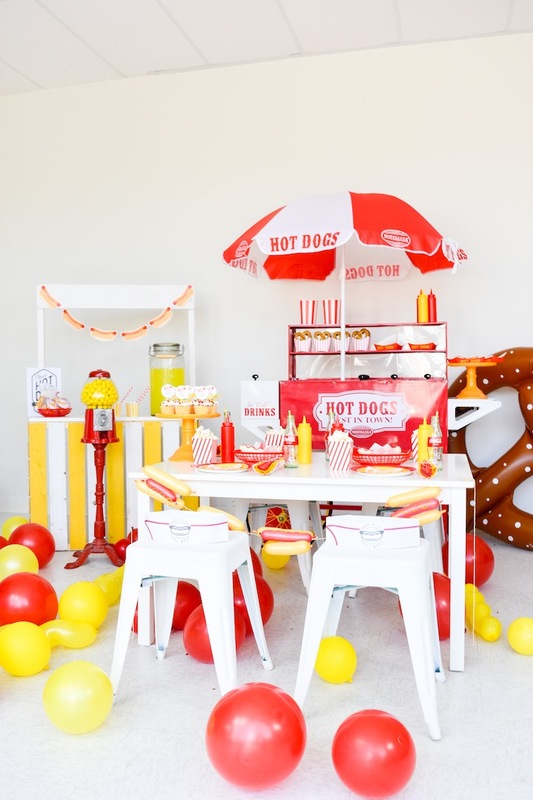 The hot dog cart was purchased on Amazon and was a major hit! 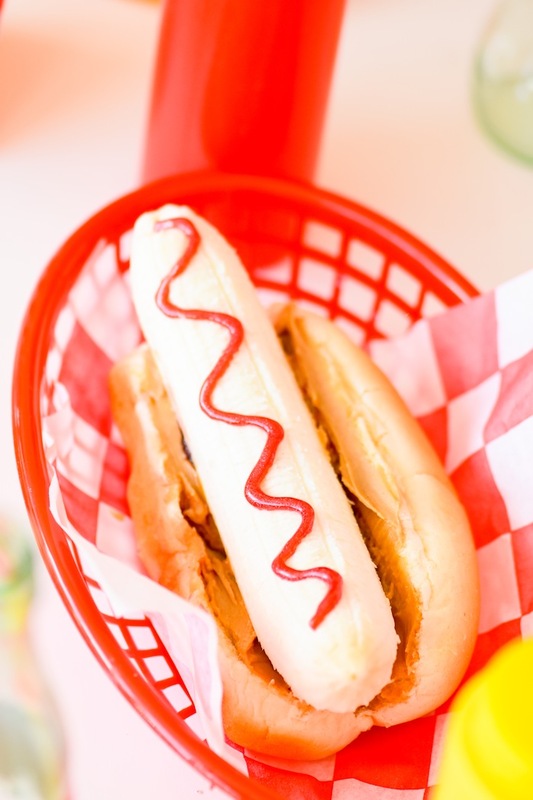 Peanut Butter & Jelly Banana Hot Dog Sandwiches! 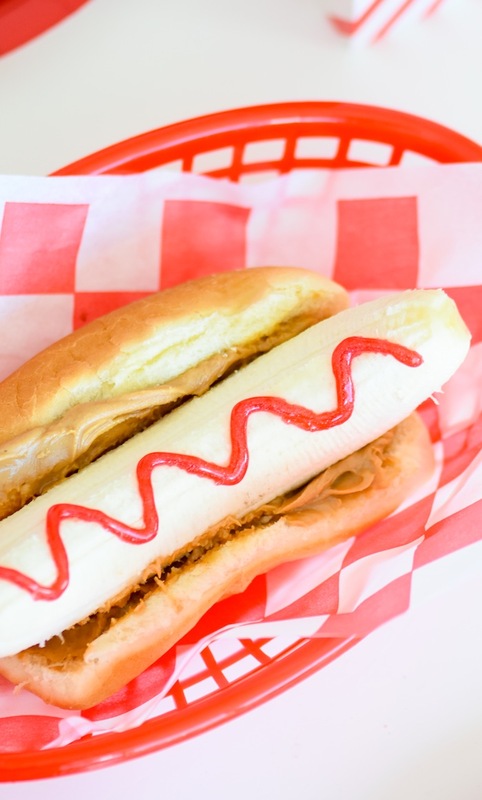 — I used hot dog buns and bananas slathered with peanut butter and a nice curvy line of strawberry sauce for a perfect combo of condiments. 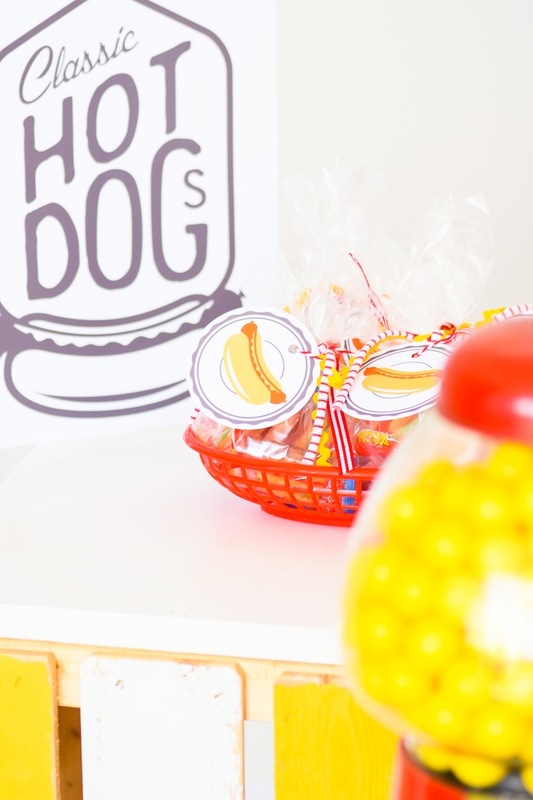 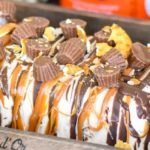 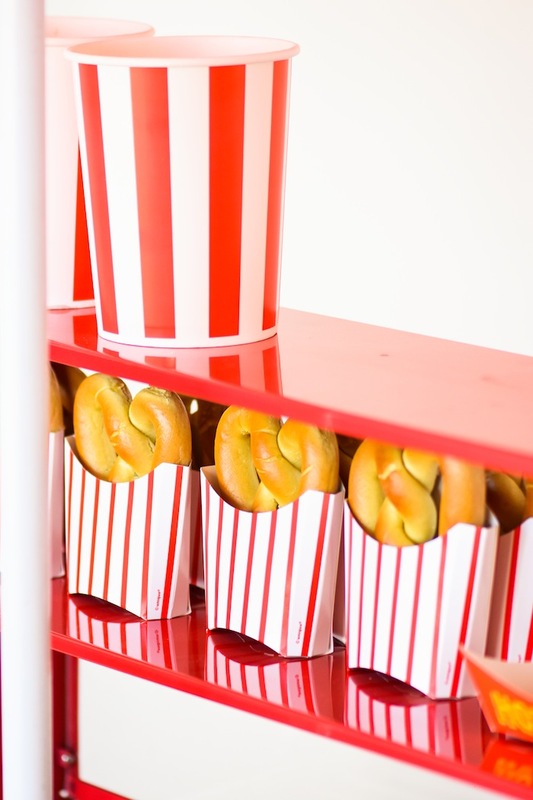 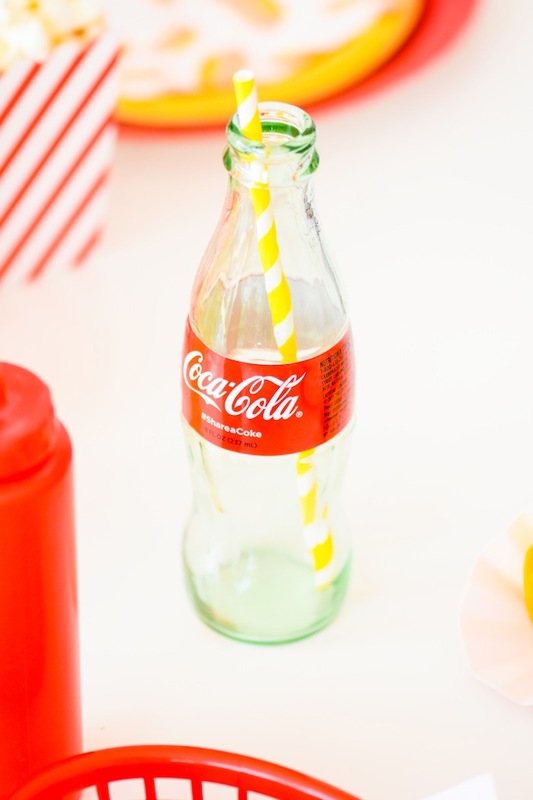 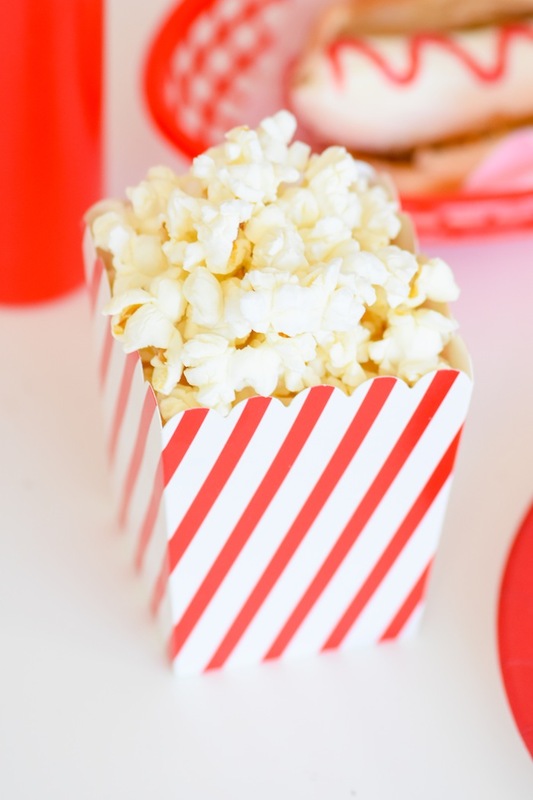 This is actually one of my kids favorite lunches so it was a no-brainer for this summer party! 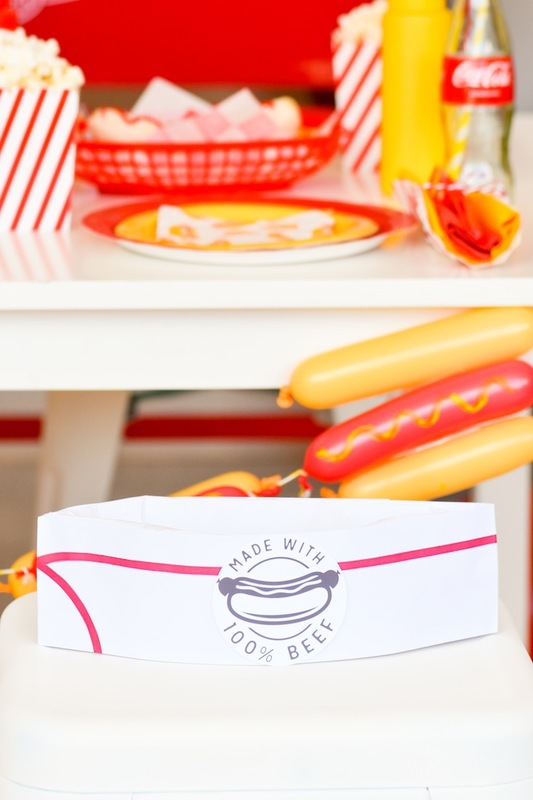 I purchased the white hot dog hats and added the free printable “Made With 100% Beef” circle tags to the front of them. 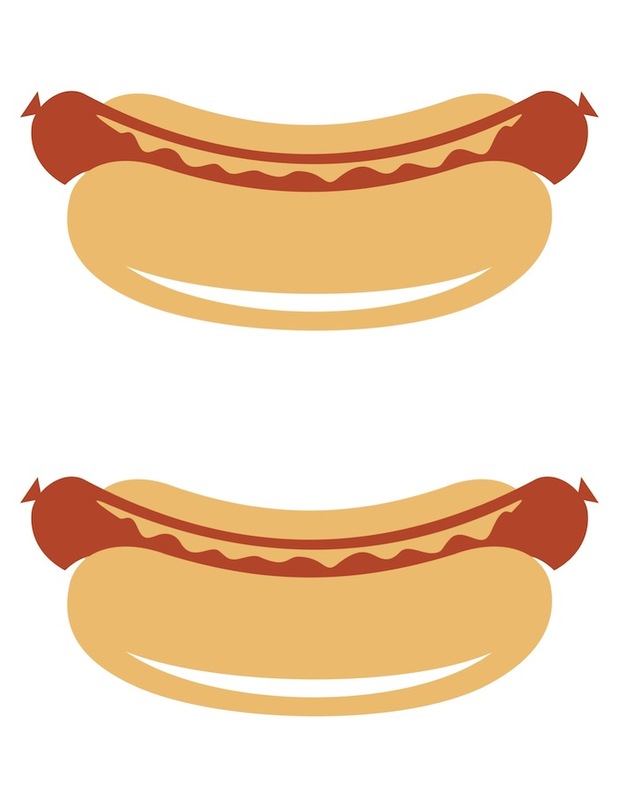 The tags are available to download at the bottom of this post! 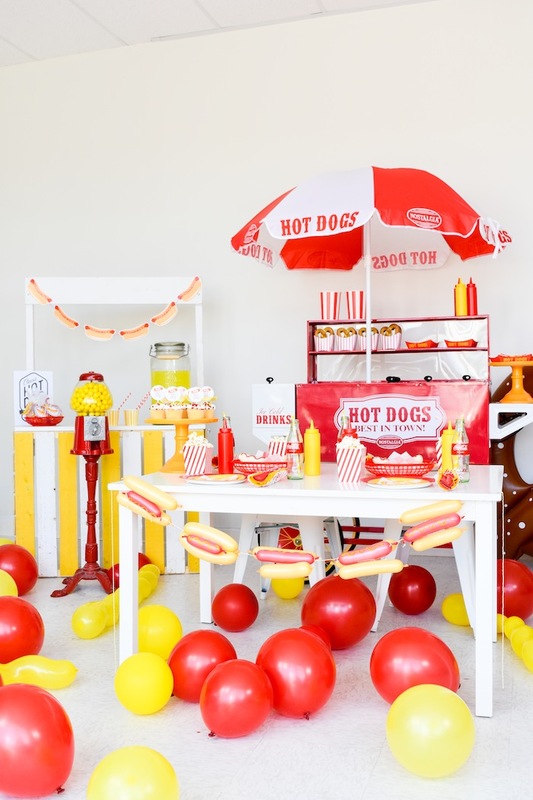 I made the hot dog balloon banner out of long latex balloons, bakers twine, yellow paint and tape (inspired by House That Lars Built)! 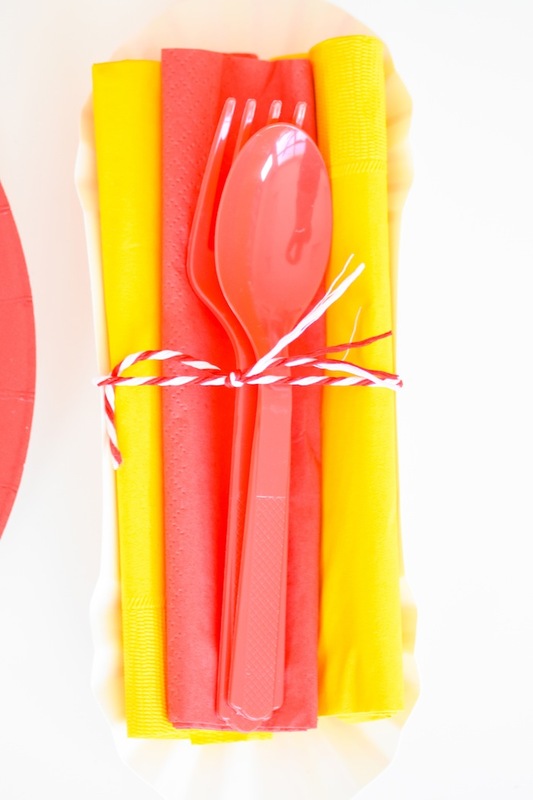 I tied one yellow napkin, a small red napkin, and utensils inside of a paper hot dog holder to resemble hot dogs themselves. 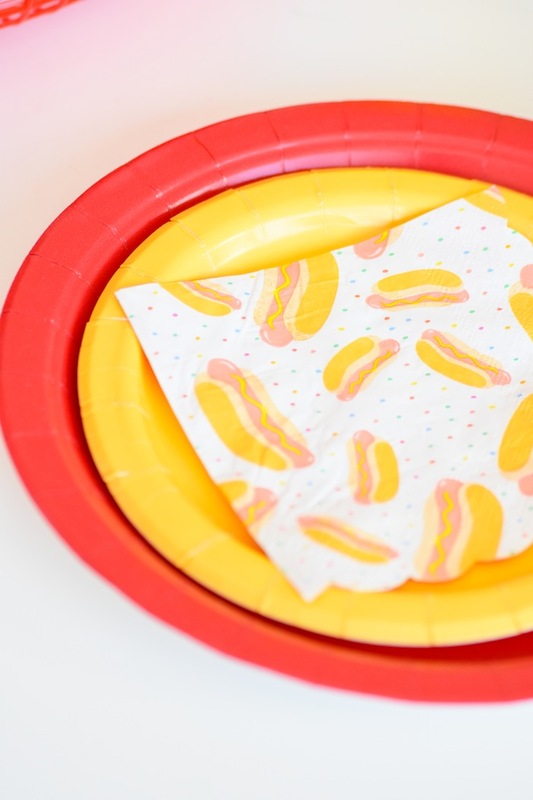 They looked so adorable next to each plate! 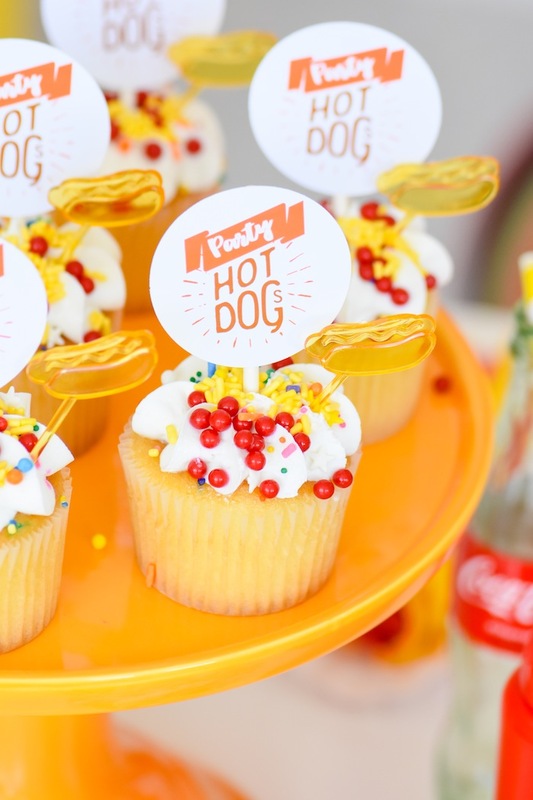 The printable hot dog cupcake toppers (available for free at the bottom this post) were easily inserted into the tops of the red and yellow sprinkled cupcakes! 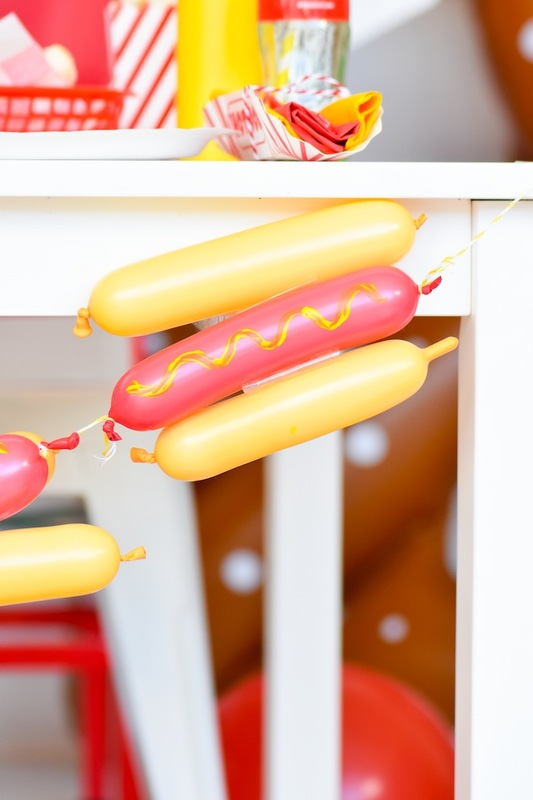 The cute printable hot dog banner (available for FREE at the bottom of this post) was printed and assembled in no time thanks to my iP8720 Canon Printer! 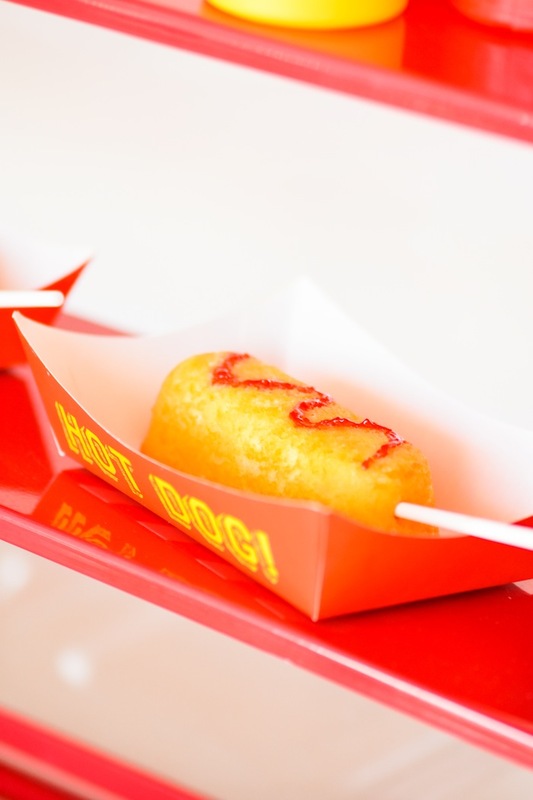 I inserted lollipop sticks into Twinkies, and put a line of red gel frosting on top to resemble a corn dog! 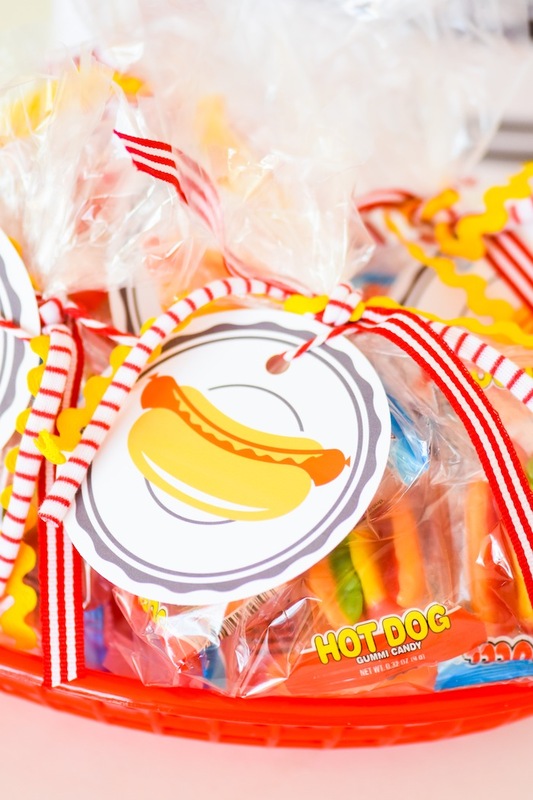 Adorable hot dog gummi candies were put in cello bags and tied with fun ribbon. 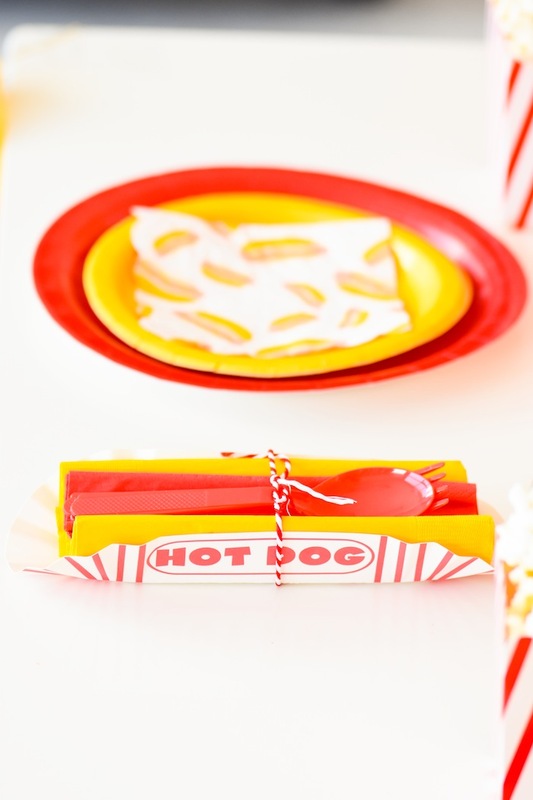 The free printable hot dog tag (download at the bottom of this post) added the perfect finishing touch! 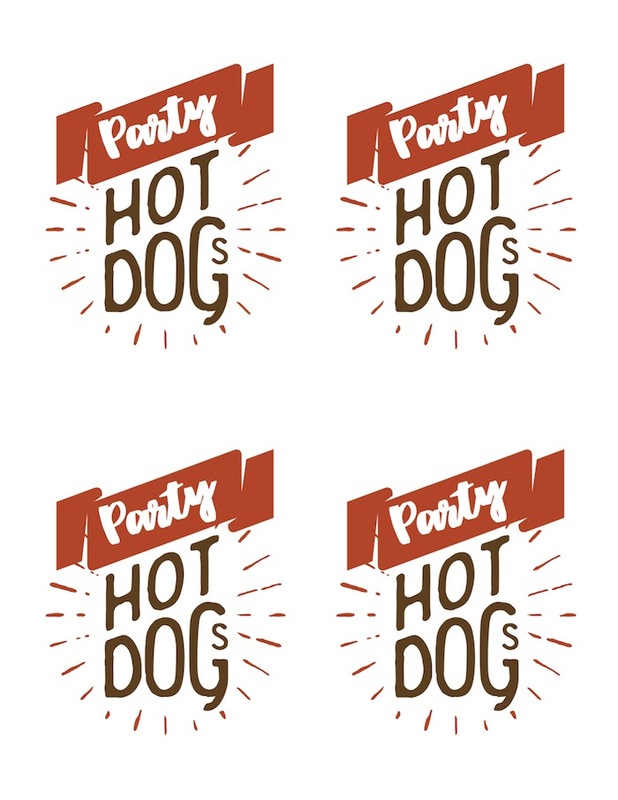 Download your free Classic Hot Dog Party Sign here. 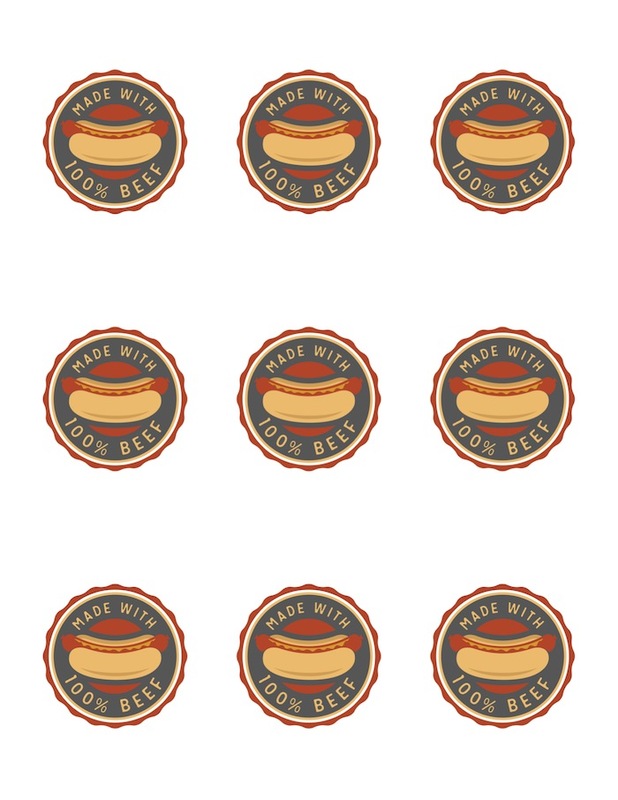 Download your free Large Hot Dog Party Circle Tags here. 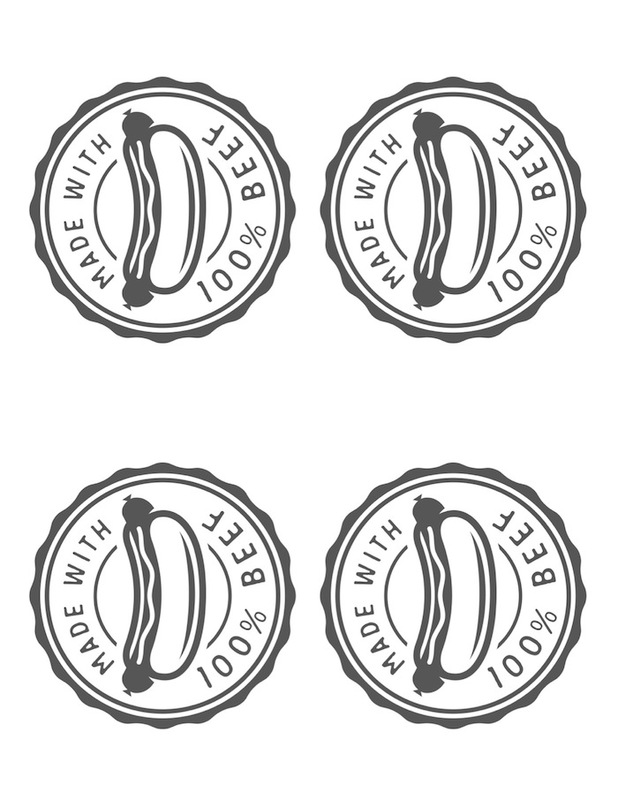 Dowload your free 100% beef hot dog hat circle tags here. 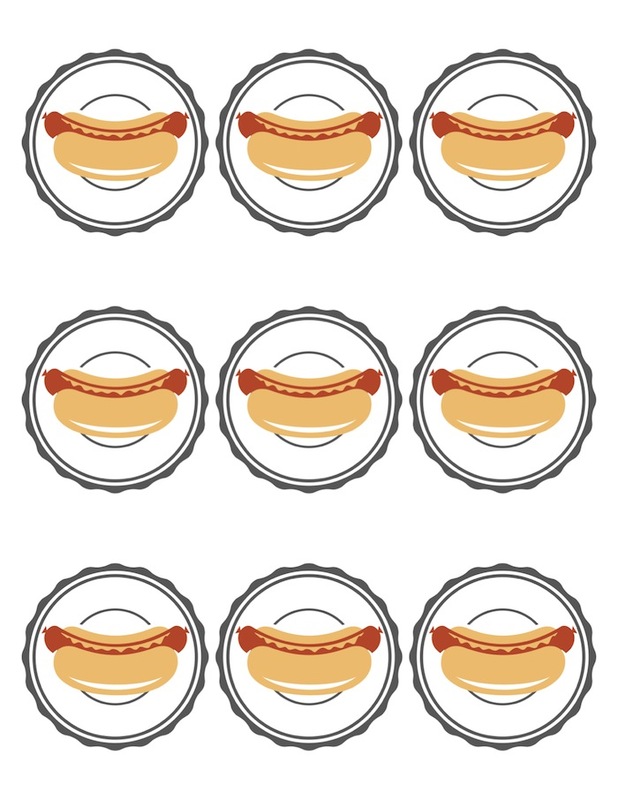 Download your free hot dog party cupcake toppers here. 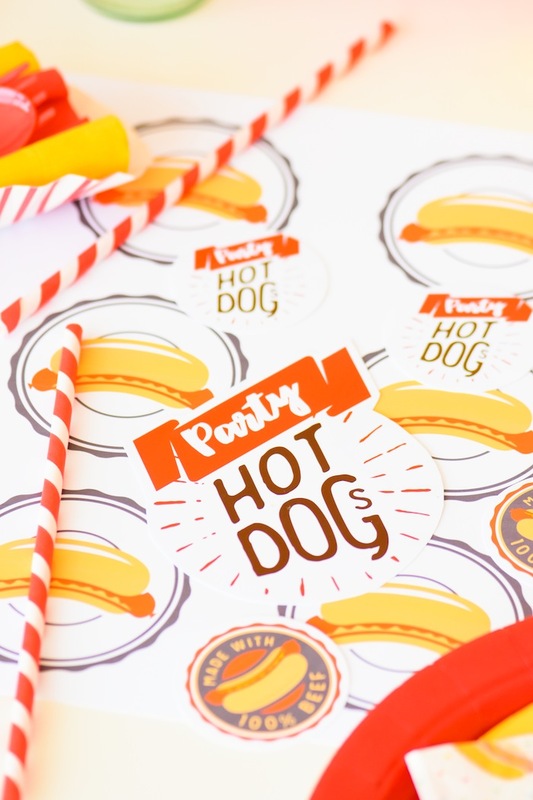 Download your free hot dog party favor circle tags here. 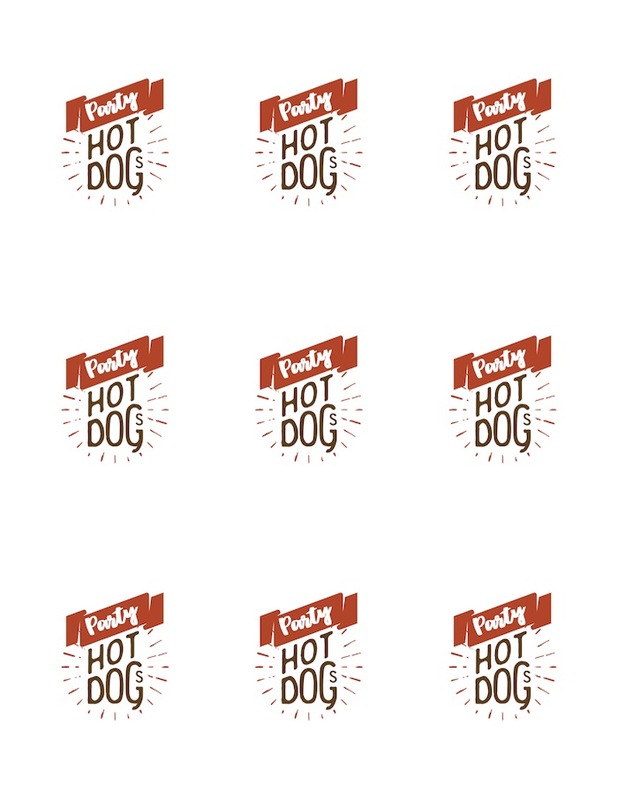 Download your free hot dog party banner here. 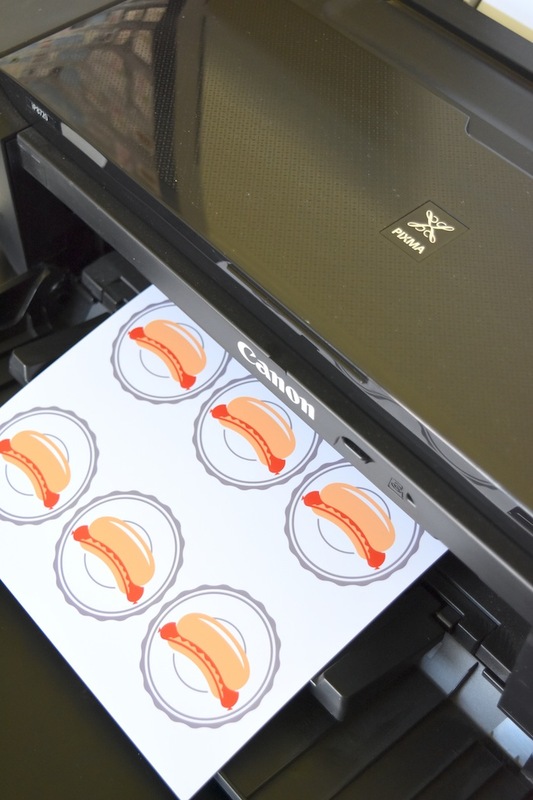 This post has been sponsored by Canon.